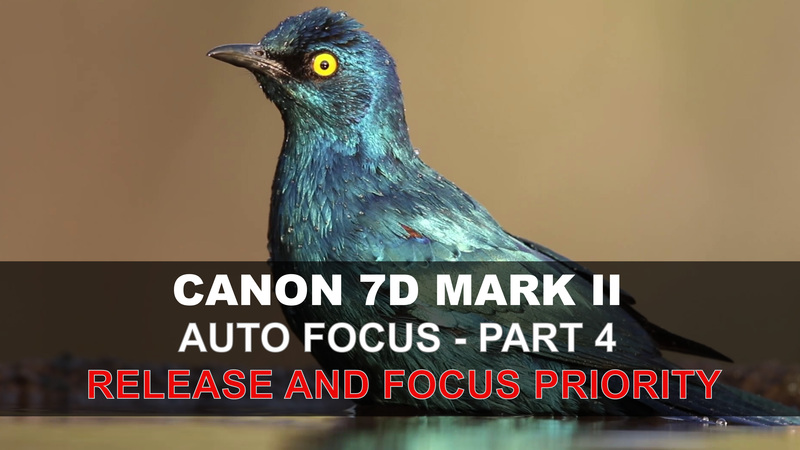 The 7Dmk2 has a highly configurable autofocus system. One of the ways that the autofocus can be set to a user’s preference is by controlling the timing of autofocus. In other words, how long the camera allows for focus to take place before the shutter is released. 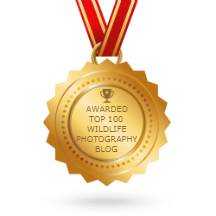 This is accomplished via the Autofocus menu tab, and the parameter that allows either Release (Speed) or Focus to be prioritized, along with an intermediate setting. The 7Dmk2 menu structure allows separate adjustment for the first image in a burst and then another adjustment screen for the second image and onwards in that burst. These settings control how much time is given over to focusing before the image is taken. Set for Release on both options, will enable the camera to reach its maximum shooting speed of 10 frames per second, regardless of how hard or easy the subject is to focus on. If the options are both set to Focus, the camera will take extra time as it needs to confirm focus, before the shutter releases. With subjects that are difficult to focus, this can lead to a slower frame rate than the maximum. In the video I describe and illustrate the options further. Very helpful again Grant. I think this is one of the areas that caused me the most confusion when I first laid hands on this camera and your explanation clarifies the settings very well. 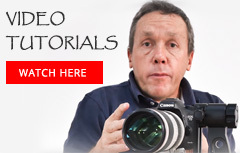 So for anyone coming to this camera as a relative newcomer your tutorials are going to save them a lot of time in understanding what these menus mean. I was also very interested to hear how you set up your camera, as to date I have tended to go for focus priority in both the first and second menu. I might change that first menu to release priority. I’m going to have to get out there and have a practice session or two. As far are choosing whether you opt for Focus for your First Image priority (Ai Servo) or rather, Release, like I do, it is pretty much a matter of preference. 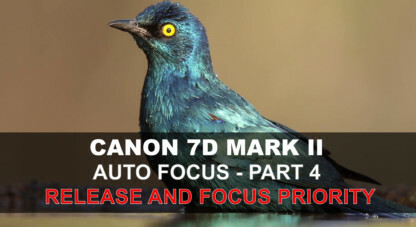 In some early Canon literature I read that the default setting on some slightly less sophisticated bodies (The 40D and 50D) for Ai Servo first image was equivalent to Release anyway, though they had no way of adjusting that…so choosing Release does give you some time for focus to take place, just not a lot of it. I also think that ones own personal preference for how responsive you like the camera to feel will come into play, especially after you have been shooting for a long time. And then the lens you have on the camera can also affect the choices for choosing whether to go with Release or Focus, or the intermediate option. For the Second image onward options I also try to take into account the speed of the camera I am using – so, for instance, the 7D2 has powerful processors, and can shoot at 10 fps, so if setting it to the Intermediate setting or fully to Focus only slows it down a little – say to 8 or 9 fps – so what. But I find that setting the 5D mk3 (with its 6fps frame rate) fully to Focus priority for Second image onward, really slows it down much more, perhaps to 4 or 3 fps…which is too slow for me. The 1DX performs different again. Grant I use backbutton focus, and thus use Release and Speed for my settings above. I always check for focus before I press the shutter first time…….which then in backbutton works well. Hope I make sense..? So if you push the AF-On button to drive focus, without taking a shot, and then start to shoot by holding down the shutter in one press, the first image will be taken with whatever setting you have chosen from the Release/Focus menu, and the second image onwards at the settings from that relevant screen, but ONLY if you are holding down the back button whilst shooting…so that AF continues to drive between each frame. Very good points Grant – thanks again! Yes Grant..thats what I meant. Holding down the AF-On button until focus achieved….and then start to shoot whilst holding down the back button.